In the process of recording nature there will always be some casualties, samples need to be collected and theories tested, this is unavoidable. However, there is one particular unfortunate incident where the collection process claimed an unintended victim. 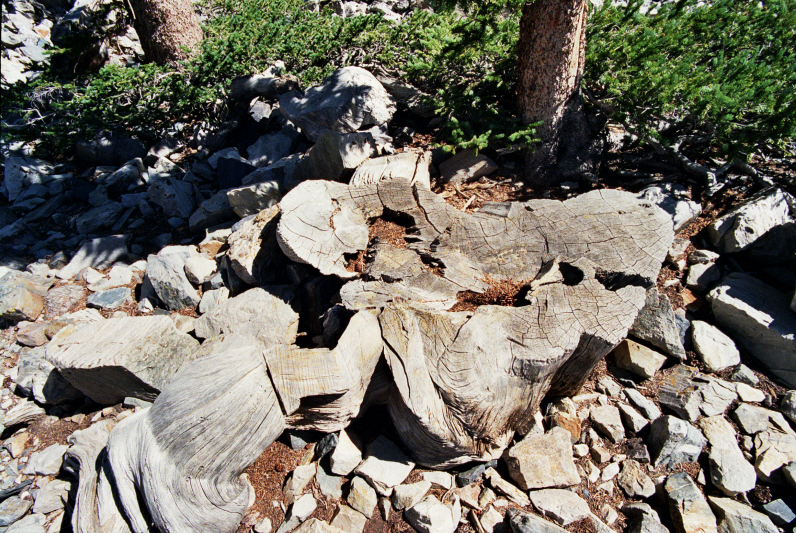 In 1964 a graduate geography student Donald R. Currey was carrying out an investigation into the climate dynamics of the Little Ice Age by looking at the Great Basin Bristlecone Pine Trees in Wheeler Park, Nevada. Currey found several of these trees and set about using a borer to sample the trees allowing him to count the rings and estimate their age. He found several trees aged over 3000 years old. However, there was one in particular which interested him. It has previously been given the nick-name the Prometheus tree. Currey tried on four occasions to use a borer to work out the age of the tree, however after several attempts (breaking two borers), he still couldn’t obtain the continuous series of overlapping cores needed. As a result he applied to the US Forrest to cut the tree down so he could more accurately gain samples. They deemed the request scientifically sound and decided that the tree was not a notable landmark. It was only later when analysing the samples that they discovered the truth. The tree wasn’t just old, it was and remains the oldest ever recorded non-clonal organism. Estimates date it having been approximately 4862 years old before its demise on August 6th 1964. Currey went on to have a successful career in science. However, he is still best known as the man who cut down the oldest tree on record. Tomorrow I will post number 3…. I wonder if he felt really badly about that? I can’t even comprehend 4862 years. That’s almost as old as human civilisation! i think he definitely feels bad about it – there’s a great NPR mention on it. it is heartbreaking. typical of humans. destroy first, think later. sickening. how could this man live with himself after committing such a crime?